Chocolate Paradise Porter #2 for tasting. 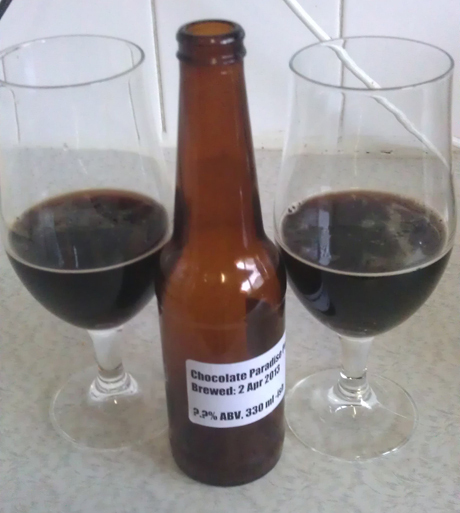 Well, as Mikey mentioned in his last post, we tasted a porter that he brewed a few weeks ago. We had the drink while bottling an IPA from Brewsmith that we made about two weeks ago, and then followed by making yet ANOTHER Chocolate Paradise Porter. So, following the first and second rules of home brew, we had to be drinking home brew. Why not kill two birds and do a tasting at the same time? I’ll start at the beginning: the taste before bottling. It’s important to taste your beer before bottling to make sure that there is nothing funky going on. It lets you know that it’s turned out OK and gives you a general idea of how things will turn out. However, prior to bottling, the beer has generally been sitting at a fairly warm temperature (optimal for yeast) and is most definitively flat. So yes, the first taste is a taste of a warm, flat beer. The beer also hasn’t been given a chance to fully mature, so it’s far from done. Prior to bottling, the smell was near perfect. The chocolate really came out and there was a little bit of smokiness to it. Exactly what a porter should smell like. The first sip, however, was interesting… it had a sourness to it that although wasn’t bad, wasn’t good. It didn’t taste like it was off or infected, but the sourness gave us a bit of a worry. We figured the beer would lose this strange aspect after some time in the bottle. The nose didn’t change at all. There wasn’t anywhere for it to go really. It was still smokey with a bit of chocolate. In the first few sips, there was still a hint of sourness to the brew, but it seemed to come from the carbonation. The carbonation was a bit strange, and it seemed to sit on my tongue a bit. Obviously carbonation is a good thing, but I don’t want it to be something I’m acutely aware of – especially in a porter. Fortunately, this weird carbonation thing went away after the beer was allowed to breath for a few minutes. The chocolate flavours were there, but overall very subtle. The chocolate came through in the nose much more than in the taste. What really came out in the taste was the smokiness. It was great, although dominant. Unfortunately this meant that the any complexities in the beer were taken away somewhat. This left us with what was still a great porter, but with nothing that stood out except for the smokiness. Please don’t get me wrong, this is far from a bad thing. I had a few bottles of this, one served at what was probably the optimal porter temperature, one served a little cooler, and one served at temperature too cold for a porter. Overall I think I liked the coldest one best. I think that this was because I found the beer surprisingly light and refreshing for a porter. Beer is always great and refreshing, but there are different styles for different times. This porter was surprisingly light and quite easy drinking. So overall, the beer turned out great. Usually I can spend a little bit more time on a porter, but this one went down far too easily. It wasn’t complex, but a complex beer can often be harder to drink. All in all, a great beer, and I’m happy at how it came out. Would like to know what eats you think go with these strange brews or whether you think this is just a pure drinking game. Well… A second beer will always go with your first beer! A heavier beer like a porter or a stout will generally go with heavier, richer foods. As a porter has a smokey characteristic, a smokier food like BBQ ribs would be good. A burger with liberal amounts of a good BBQ sauce would also be great. As I think this porter was on the lighter side of the porter range, something on the lighter side of heavy would be good. I just so happened to be drinking this brew while eating a wood fired pizza with salami, fresh tomatoes and fresh basil, and it went really well. Have to agree with most of what you said. Except, I still prefer this at room temperature. The sourness was disappointing. But admittedly was a lot less, and I hardly noticed it in the last bottle. The smoky flavour is fantastic, didn’t really expect that at all. I can’t remember it being there on the first version of this back in January. So, pretty happy. I’ve talked to some others and most have said the same thing. A dark beer like this could probably condition in the bottle for another 2-8 weeks and become a fair bit better. This might of helped the body of the beer, but maybe there wasn’t enough for it to build on. Overall, think this one turned out quite good. Well said Mikey. I think the sourness backed off a bit when it was cold, which is why I liked it more. It just seemed to settle the beer down a bit. We’ll see how the next one turns out!